SARONNO,Italy - Who can think of June without thinking of smiling brides, proud grooms, champagne toasts and honeymoons. 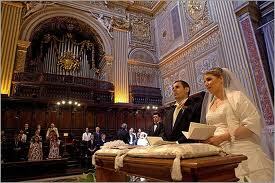 More couples get married in June than any other month of the year, and some lucky couples get married at the Vatican. Yes, it is possible, even if it’s a lot more difficult these days than it was in the past. Only a limited number of weddings are performed there each year, and if you want to be one of the lucky few, you’ll have to get your application in early. It’s not easy. The Vatican does not accept every request and the documentation you have to provide is much more detailed than what your local parish needs. 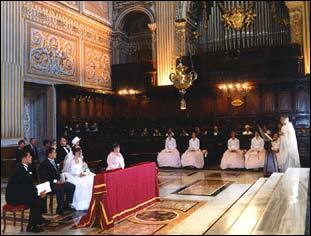 Also, you can count on the pastors at St. Peter’s to ask why you want to get married at the Vatican. They really don’t understand why anyone would travel to a foreign country to get married. They assume a couple would want to get married at their home parish so all of their family members and friends can celebrate with them. That means you’ll have to bring along more than a few family members and friends. A minimum of 15 – 20 guests must attend the ceremony. St. Peter’s has, in the past, rejected wedding requests with fewer guests as they don’t want to develop the reputation of being an elopement chapel. Weddings are only allowed on Mondays, Tuesdays, Thursdays and Fridays at 10:30 a.m and only in the Cappello del Coro, or Chapel of the Choir, a side chapel of the Basilica. The chapel seats 100 people, and another 100 standing, for a total of 200 guests. You’ll have to start the process six to nine months in advance. The first step is to meet with your parish priest to learn what the diocesan requirements are. You also have to contact one of the priests at Santa Susanna, the American Catholic Church in Rome, and inform them of your interest in applying for marriage at St. Peter’s. It’s important not to apply any earlier than six to nine months before your proposed wedding date. The final date won’t be officially set until the documentation is complete and has been submitted and approved. Sometime a date can be established beforehand, but this requires your pastor to send a special letter to the pastor of St. Peter’s. This can be a little frustrating if you are trying to plan your wedding in advance, especially if you have to make plane reservations, but that is the way things are done at the Vatican. Even if you meet all of the stringent requirements, make all the travel arrangements and arrive in Rome with your entourage of family and guests, your wedding may be postponed at the last minute. There is always the chance that the Papal Household will schedule a special Mass that the Pope will celebrate at St. Peter’s Basilica. If the mass takes place in the morning, you out of luck. It doesn’t happen often, but it happens. Unfortunately the Papal Household doesn’t announce the Pope’s schedule very far in advance, but they aren’t entirely heartless. If you absolutely cannot change the date and the time, they will try to move your ceremony to the Church of Santa Susanna. Now for the answers to the $64,000 question: How Much Does it Cost. Church paperwork, administrative costs and time of the Santa Susanna Parish staff, and the organist and priest is 1,300 euros (or the equivalent in U.S. dollars). The fee must be paid in full, by check made out to the Paulist Fathers, at least two months prior to the wedding date. If you cancel the wedding after that date, the fees are not refundable. In addition, a 200 euro deposit, or American dollar equivalent, is required once the date is confirmed at St. Peter’s Basilica. This amount will be deducted from the total fee. A personal gift to the priest performing the ceremony is not required but suggested, and the suggested amount is around 100 euros, more or less. The gift should be given on the day of the wedding along with your thanks for his assistance. Photographers, soloists and flowers are all extra, and additional services of this type can only be provided by Vatican approved vendors. 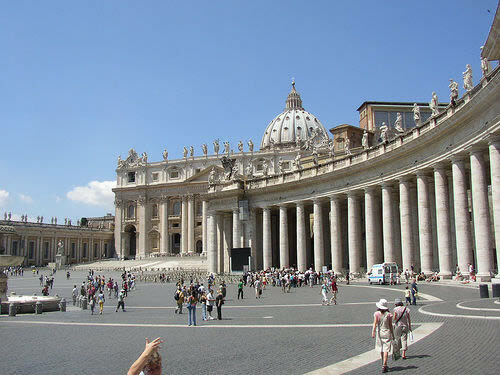 The average cost for flowers is 75 euros, but as the Vatican Chapel is so beautiful, flowers are not really required. However, if you do want to order bouquets and boutonnieres, you can obtain a list of Vatican approved florists. Photographers fees will run between 400 to 700 euros, and a list of Vatican approved photographers is also available. Your photographs are given to you in the form of contact prints and negatives which you then take home and have printed. If you want a video of the ceremony, one VHS compatible formatted video approximately ½ hour long, will cost you between 350 – 700 euros. The photographer you chose (from their list) must ask for permission at least 10 days prior to the ceremony, and permission is only given for photographs taken in the Chapel of the Choir, (Cappella del Coro) and in the piazza in front of the Basilica, never inside the Basilica itself. A soloist will add an additional 100 euros to your bill. Choice of music is limited to what the organist and soloist know, and unfortunately the names of the organist and soloist are not known until the day of the wedding. But ....... if you are willing to jump through all of those hoops, then you too can be one of the favored few who can boast that they got married at the Vatican in Rome. Life: Just Say "I Do"